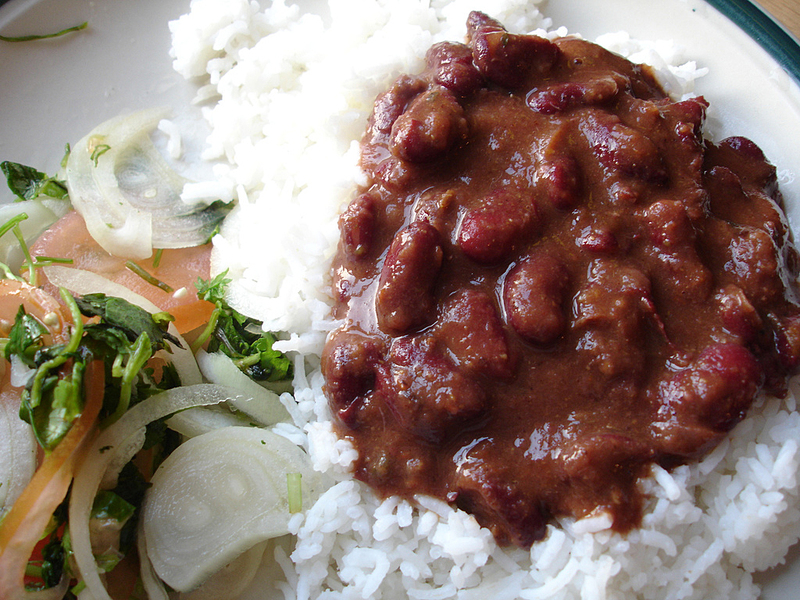 Rice and beans, a staple food of many cultures around the world. Dr. McDougall, in his March 2009 newsletter, discusses “de novo lipogenesis,” a term that describes the pathway for converting dietary carbohydrate into body fat. He says the pathway is not utilized much in humans, that “excess starch does not turn to body fat.” He provides several references to support his claim. They do indeed back the notion that excess carbohydrate or replacement of dietary fat by carbohydrate does not induce de novo lipogenesis to any substantial degree. That study where women were overfed by 50% is something else. That’s like having them eat 3000 calories/day instead of 2000, in sugar no less. And they put on hardly any body fat. That reminds me of the Cubans during their Special Period, where they lost weight and lowered their rates of diabetes, heart disease, and cancer, by eating a diet of primarily rice and sugar. If carbohydrate intake doesn’t induce de novo lipogenesis to any substantial degree, why would these authors (whose study gave saturated fat consumption the green light) say it does? This entry was posted in Obesity, Plant-Based Diets on March 24, 2014 by Bix. Dr. McDougall is the polar opposite of Gary Taubes (http://fanaticcook.blogspot.com/2011/04/gary-taubes-is-sugar-toxic.html). Well, do carbs make us fat or does fat make us fat? When Chris Voigt ate only potatoes, 20 a day for 60 days, he lost weight and body fat. His blood sugar went down too. In the 1990s, the Cubans lost weight and reduced their incidence of diabetes, heart disease, and cancer when they lowered their fat intake (to ~15%) while eating a diet of primarily rice and sugar. Since these things really did happen I would call them realistic. But the new celebration of “healthy fats” and ketogenic diets is a very recent pheomenon. If that’s true, why did so many people constantly gain weight since the 80ies while eating all of those terrible industrial zero fat products? I really want to believe this, because I really like starches – but I DID gain weight in the past while on a pinapple and also while on a rice diet. From my own experience, what keeps weight under control is phases of water fasting. Ideally I would like to alternate between eating a vegan high starch diet at the other days, but it is just so, so much easier to transition into fasting periods coming from a high fat diet. When I eat starches, I constantly oscillate between feeling too full and feeling hungry again – phases of happy equilibrium in between are very short, whereas on high fat feel the same all day. I know this is “anectdotal”, but does that mean it can be ignored. PErhaps the starch solution only works for those who are metabolically in a specific group with that glucose preference? Contrast that 30% with the 7% of calories from fat in the study I just posted, where people ate as much food as they wanted and still lost weight, lowered their blood pressure, blood glucose, blood cholesterol. I’m the same way: Ideally I could eat as many fruits/vegetables as I want, but I’ve only seen weight loss and steady energy, better sleep, etc., on vegan keto, probably due in part to the menu choices and also because I don’t retain as much water on a <20g and under net carb count. What I've been thinking about is how to safely transition from LCHF to HCLF without overlapping the two too closely together. The fasting idea works, but I'd also like to keep my metabolism constant and stick to a solid eating schedule. Still experimenting a bit and seeing what happens. I'm ~5 lbs-ish from my ideal weight, but at this point, the slightest adjustments make a big difference (and I mean if I make the wrong move, I'm up 5 lbs). Not much margin left for error, it seems. I wonder about this as well. I (and my people, lol) seem to fare better on a HCLF diet, as long as those carbs come from whole foods (even processed foods don’t lead to so much weight gain unless I really stuff myself, which I was prone to doing once going vegan). However, I can never seem to be full on fats, so the weight loss pretty much begins and ends with being hungry. The body is a mysterious machine.